After enjoying a leisurely morning with our friends on their farm, we headed south out of Forest City. Given our late start and some stormy weather forecasted across Kansas and Missouri, we decided to split the one-day trip to Kansas City into two. 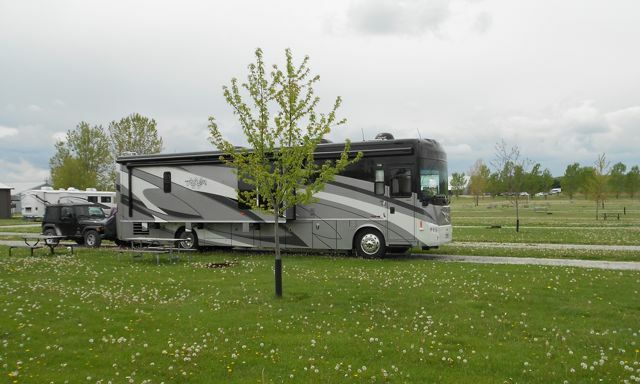 Gary and Francile recommended an overnight spot halfway between their place and Kansas City. So, we decided to check it out. Lakeside Hotel and Casino sits just off I-35 in Osceola, Iowa. 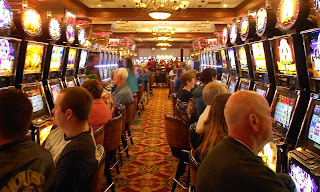 We made our way to the handy pull-through site that was just a short walk to the casino. Our friends were right. This is a perfect place to call home for a night. We're not gamblers, really. But, we did take time to check out the casino. These folks look like they're enjoying themselves. We decided to spend our dough in the casino restaurant, where we enjoyed a perfectly acceptable dinner. With no dishes to do, we enjoyed a relaxing and restful evening in our comfortable site. Today's forecast called for rain along our route. But, thankfully, it was nothing severe. We received this wet welcome as we crossed into Missouri. By early afternoon, we were tucked into our "home park" in Kansas City, where we are looking forward to spending time with family and friends for the next month. The third and final (or so we thought) stop on our Spring Moose Maintenance Tour was Forest City, Iowa, the home of Winnebago Industries. 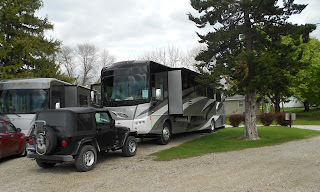 We arrived in this tiny Northern Iowa town Sunday afternoon and squeezed into the last available spot in the Customer Service parking area. At 7:00 Monday morning, we met with our service tech, who went through our list of three service items and whisked the moose off to a service bay. A couple of our service items were rather extensive, so we were prepared to spend a few nights out of the moose. 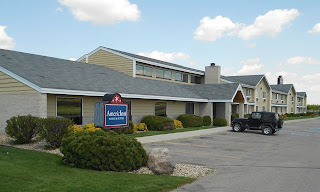 Monday morning we checked in to our favorite pet-friendly motel in nearby Clear Lake. And, we waited. Clear Lake is a lovely town. But, while we waited for our moose it was as if time stood still. As it turned out, we only needed to spend one night at the hotel...this time. We returned to Forest City on Tuesday afternoon to pick up the moose. There was good news and there was bad news. The bad news was our service wasn't complete. We had parts to wait for. One would be in in a couple of days. The other would take two weeks. We decided to wait just two days for now, and scheduled a return trip in May. 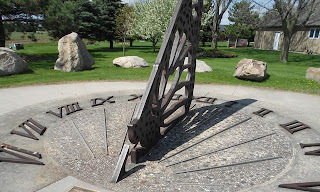 Instead of parking in the Service Center circus, we spent two lovely days in Pammel Park. 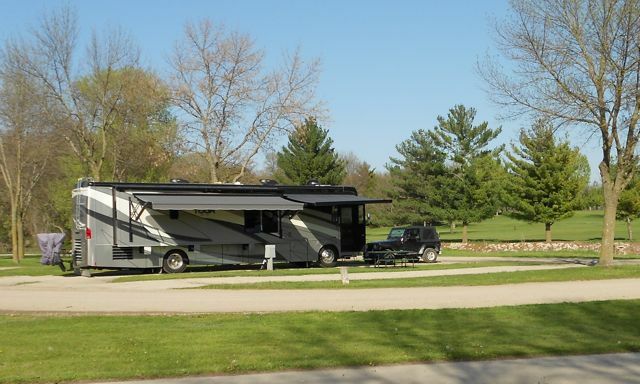 We enjoyed this spacious site with stream and golf course views and practically had the park to ourselves. All this peace and quiet cost us just $15 a night. What a deal! We kept ourselves entertained while we waited in Forest City. We did some geocaching and exploring around this very familiar town. 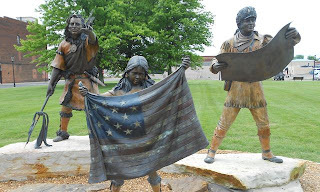 We stopped by the Winnebago Visitor's Center and visited the exhibits on its second floor, which we had missed on a prior visit. This life-sized cut out of Winnebago's Founder, John K. Hanson, made us smile. Thursday morning we received news that our part had arrived. So, we made our way back to the Service Center. 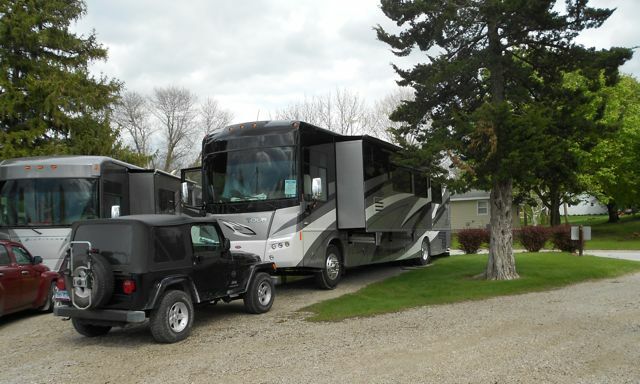 This particular trip to Winnebago has been our most frustrating. We won't go into detail here, but suffice it to say we spent most of yesterday waiting on our Winnie while it sat outside the service bay. Doesn't our moose look lonely? We weren't particularly happy. 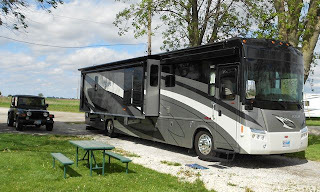 Our less than satisfying trip to Winnebago was salvaged by our wonderful friends Francile and Gary. They graciously offered us a spot to park for a couple of nights at their farm in nearby Thompson. We enjoyed wonderful conversation, good food and a couple of movies during our stay. To top things off, they broke in their new margarita machine. 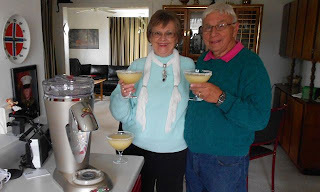 There's nothing like an ice-cold homemade margarita to wash away our Winnie worries. Thanks so much, friends! Tomorrow, we're heading south for a month-long visit in our native home town. But, in the words of our former California governor: "We'll be back." One of the tools we use to determine places to explore is the book "1,000 Places to See in the U.S. and Canada Before You Die." Actually, I am notorious for checking the book just after we've left a part of the country where several places are listed in the book. 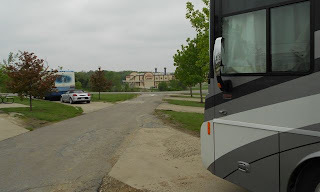 With a few days between service appointments in Iowa, we consulted the book, which pointed us to the Amana Colonies, just west of Iowa City. 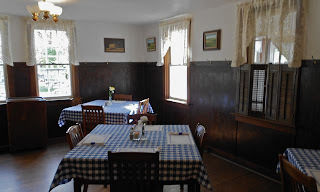 The Amana Colonies, a National Historic Landmark, is a group of seven villages covering some 26,000 acres along the Iowa River. The villages, which are all no farther apart than an hour's drive by oxcart, were founded in the mid-19th Century by the Community of True Inspiration, a German religious society that came to America to escape persecution. They named their community Amana, which in the Song Of Soloman means "to remain true." For nearly 80 years, the communal villages thrived in a self-sufficient manor. Each of the villages had a main street for shops. 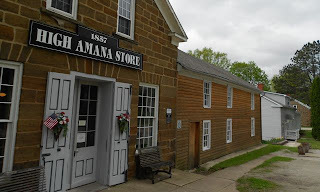 In the village of High Amana, today the original general store is run by the Amana Society, the corporate heir to the land and economic assets of communal Amana. 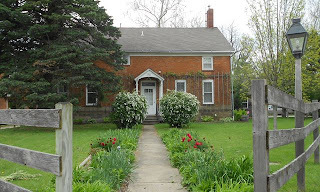 We started our 17-mile loop tour of the colonies in High Amana, where a lovely woman behind the counter in the village store gave us a most informative introduction to the history of this unique community. We were so grateful for her introduction, because most of the museums around the colonies are not yet open for the season. We're here before things really get "cooking" in Amana. Our friendly "guide" pointed across the street from the store to this house and explained its significance to the colonies. In the 1930s, this was the place where a couple of locals put their heads together to build a beverage cooler for the store. 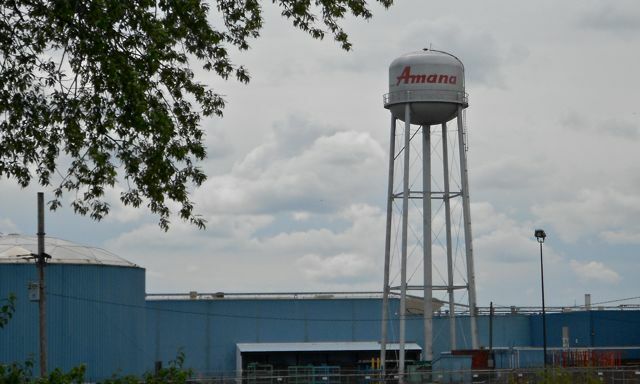 That modest effort was the start of Amana Refrigeration. It was here, in 1947, that the first upright home freezer was manufactured. The first side-by-side refrigerator freezer came a couple of years later. Since then, this factory has churned out air conditioners and microwaves, and has served as a major employer in the area. Today, Amana is a division of Whirlpool. 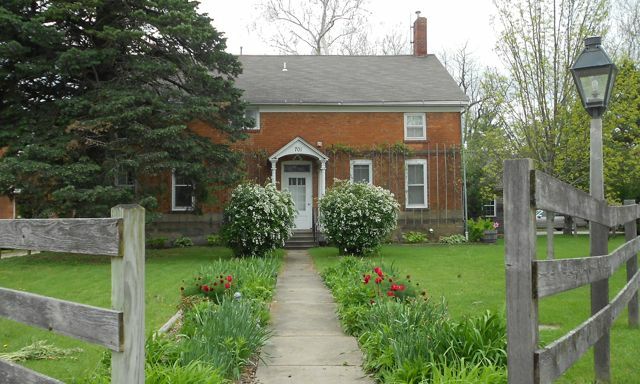 The village of West Amana is home to the Schanz Broom and Basket Shop, which showcases the work of local craft artisans. 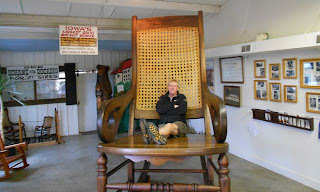 Next door is the Giant Rocker, which is billed as Iowa's Largest Solid Wood Rocker. At over 11 feet tall and weighing in at 650 pounds, we won't dispute that claim! The chair was constructed by Schanz Family woodworkers at their furniture workshop in South Amana. 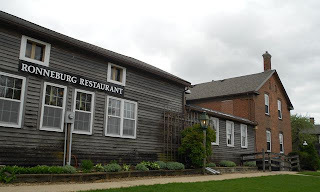 We enjoyed lunch at Ronneburg Restaurant in Amana, the largest of the seven villages. 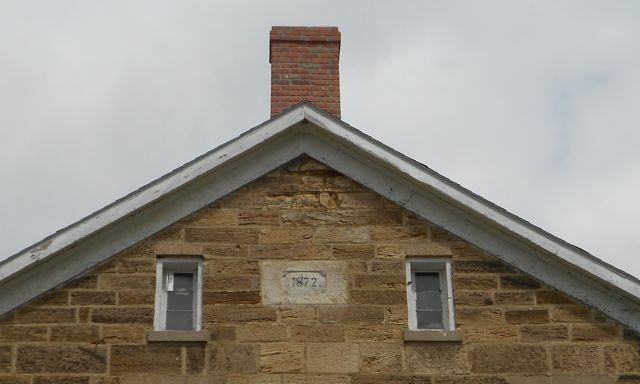 The building originally served as one of the Amana Colonies' communal kitchens. Every home in the colonies was assigned to a kitchen where they would receive their daily meals. The neighborhood women worked under the direction of the kitchen boss to cook, garden, serve and clean. Men ate at one table, and women and children ate at another. Fifteen minutes were allowed for each meal period. No conversation was allowed and music was strictly forbidden. Modern day diners can take their time enjoying tasty German food over welcome conversation and pleasant background music. 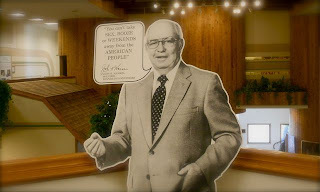 We got another taste of early Amana dining this morning at the Colony Inn Restaurant. Originally known as the Amana Hotel, this building has welcomed visitors since 1860. 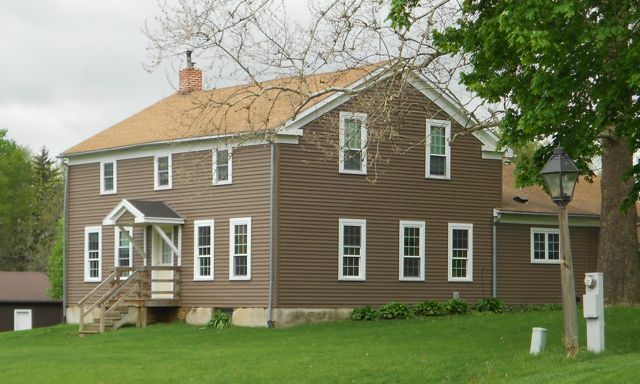 The simple interior and tasty family-style breakfast made it easy to imagine life in early Amana. The architecture throughout the colonies is simple. Many original homes and buildings are constructed of native limestone. Several businesses that originated to serve the self-sufficient, communal colonies continue today as commercial concerns. At the Amana Woolen Mill, visitors can watch looms in action. The pieces produced here are known for their high quality. In addition to lovely blankets and other woolen goods, these colorful spindle-ends of yarn are available for sale. Residents have also established several "modern-day" businesses. Of course, I had to check out Heritage Designs Quilting and Needlework. 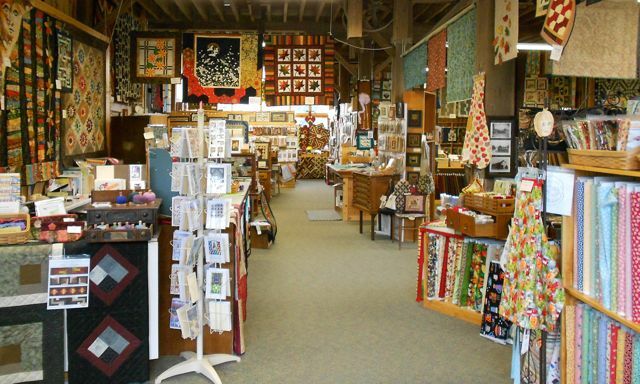 This lovely family-owned shop has been in business since 1976, and has been recognized as one of the top 10 quilt shops in the country. 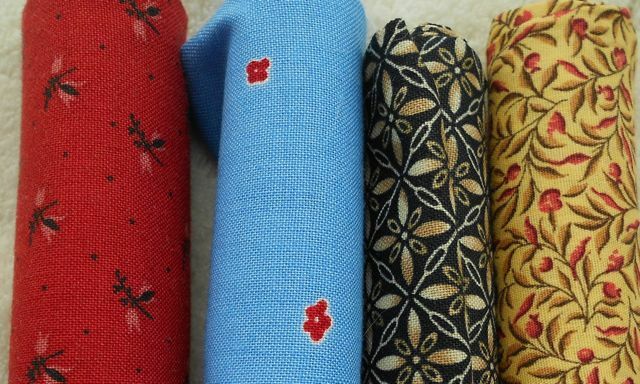 A quilter could get lost in here! 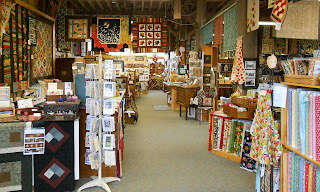 And, if you can find your way out of this shop, there's another quilt shop in South Amana! We included a bit of geocaching in our visit to the colonies. As always, our treasure hunting brought us to some interesting sites a bit off the beaten path, like the Amana train depot. 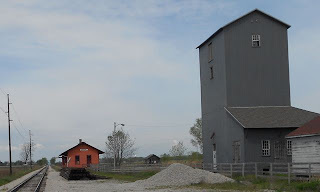 The depot is the trailhead for the Kolonieweg, a 3.1-mile trail connecting the villages of Amana and Middle Amana. Today the Amana Colonies offer everything a 21st century visitor could want, including a large RV park, which is owned and operated by the Amana Society. 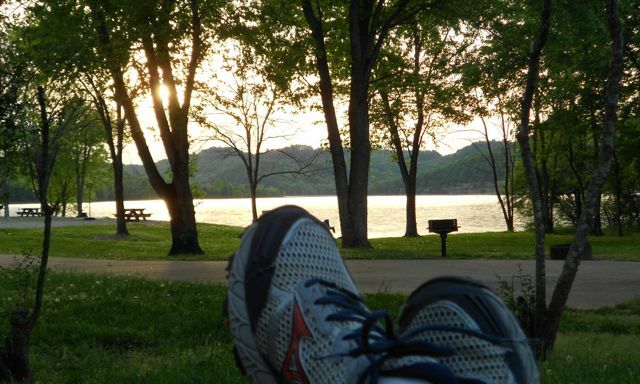 The park is large, level, grassy, treeless and very spacious this time of year. No, our moose didn't make this mess. 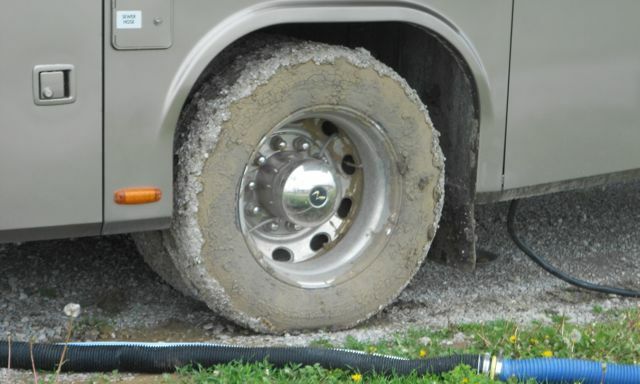 These are two of the back tires of a motorhome that plowed its way into a spot late the other night in the middle of a rainstorm. We heard spinning wheels and a diesel engine whining. It didn't sound good, and it wasn't. The next morning, this rig had to be pulled out of some mighty muddy ruts. This afternoon we enjoyed a very pleasant geocaching walk around Lily Lake. As we were nearing the completion of the loop, we noticed this cheerful message painted on the trail in front of Amana Elementary School. It seemed a fitting way to wrap up our visit in this lovely community. 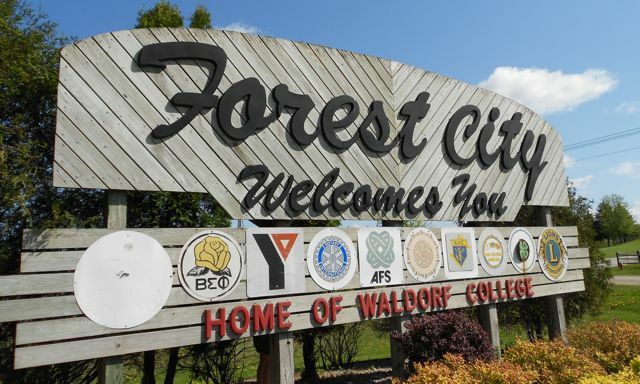 Tomorrow, we're off to Forest City. It's not listed in the 1,000 Places book. 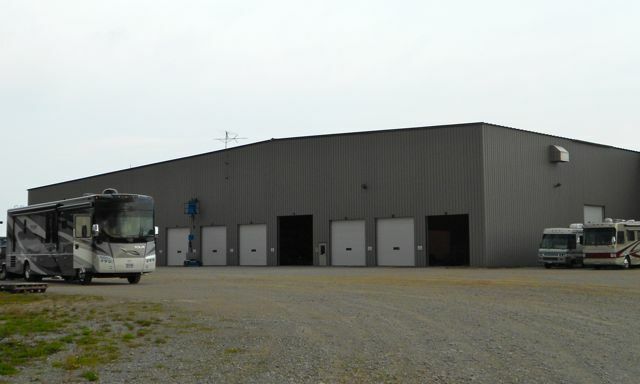 But, if you want to get a Winnebago fixed, it's the place to go. 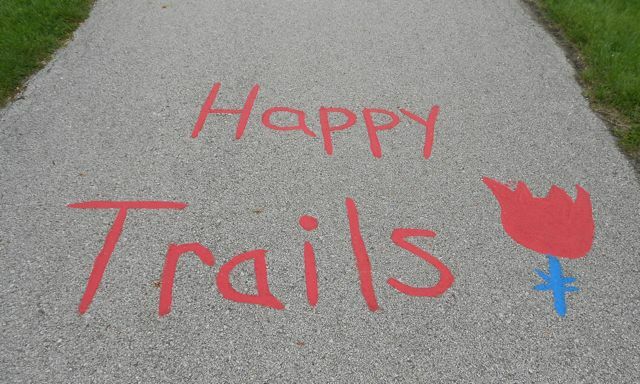 Here's hoping it's a happy trail, indeed! Добро пожаловать в Москву! Actually, in these parts, folks are much more likely to say "howdy" and give you a wave. Welcome to Moscow, Iowa, the second stop on our Spring Moose Maintenance Tour. Moscow is the home of HWH, the manufacturers of Bullwinkle's leveling jacks and room slideouts. We arrived here yesterday afternoon and parked for the night in preparation of our early morning checkup. Our moose was pulled into a service bay by 7:00 a.m. The friendly woman at the service counter recommended breakfast at a very tasty family restaurant in nearby Tipton. 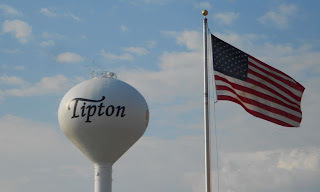 We traveled eight miles north of HWH and found this quaint little town. From our booth, we listened to a group of locals solve the problems of the world while we enjoyed a hearty breakfast. By the time we returned to Moscow, Bullwinkle was ready to roll. The good people of HWH provided this diagnostic check at no charge. 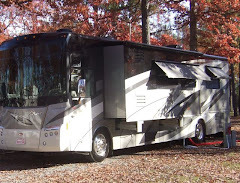 They corrected a small problem for a small price and we hit the road with peace of mind about these essential systems. While we were hitching the squirrel to the moose, we watched this storm pass to the east. This garden-variety thunderstorm looked far more dramatic than it was. The wide open spaces of southeast Iowa gave us a panoramic view. From Moscow we headed west toward Iowa City, dodging a few raindrops on the way. 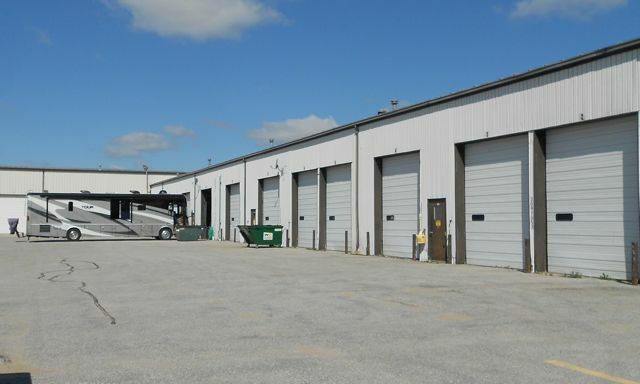 Tonight, we're listening to raindrops on the roof from our site in Amana, Iowa. The forecast for the next few days calls for cool temperatures and gray skies. That'll be just fine as we explore the Amana Colonies. Traveling through the midwest in Spring can be a dicey proposition. Mother Nature can dish out some pretty nasty weather this time of year. So, we allowed plenty of time to get to the next appointment on our Moose Maintenance Tour, which is Thursday in southeast Iowa. Our plan was to leave Paducah and head northwest to Iowa. But, Mother Nature had other plans. 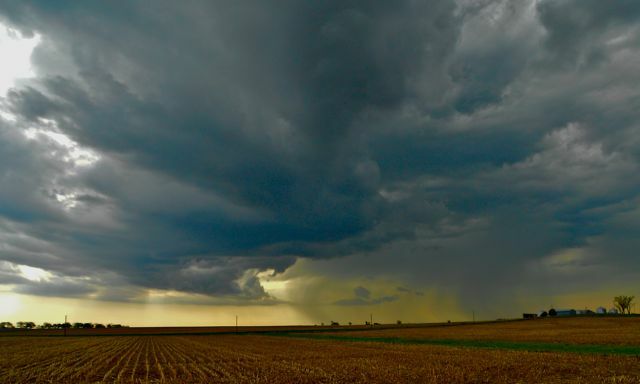 A much-anticipated storm system was sweeping across the nation's mid-section. The weather maps we'd been monitoring for days painted a red swath of severe weather across much of our intended route. 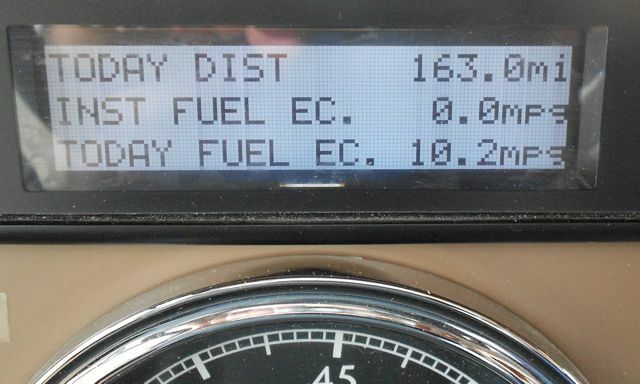 The first 100 or so miles were clear, so we opted to make our Saturday travel day a short one. After a quick fuel stop and a 75-mile run north, we spent the night in one of our favorite overnight campgrounds in Whittington, IL to wait out the weather. Sunday morning we were up early to check the weather. 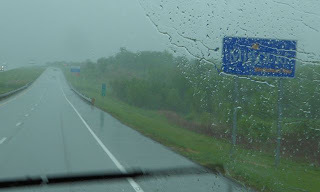 Severe storms were anticipated on our route into northeast Missouri. 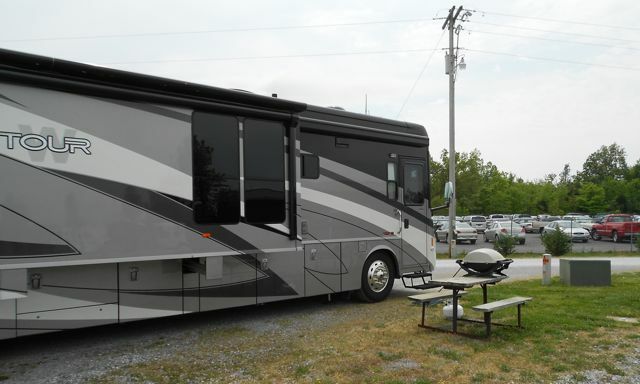 By evening, the storms were expected to take aim on our cozy campground in Whittington. To top things off, the entire region was blanketed in our most-hated alert: A Wind Advisory. It warned of sustained southerly winds of 30 mph with gusts to 45. Our intended route was largely east to west, which would mean fighting a stiff crosswind into potentially severe storms. Not good. Instead, we decided to take advantage of the southerly winds and travel north 165 miles on I-57 to Champaign. 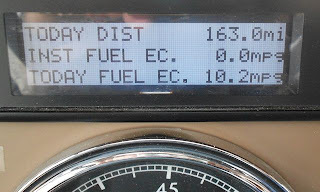 The stiff tailwind gave us smooth travels and some pretty impressive miles per gallon. 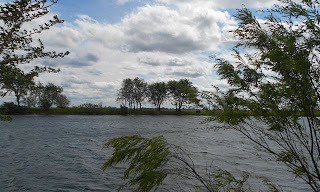 By the time we arrived at D&W Campground in Champaign, the winds were fierce. With potentially severe storms in the evening forecast, we checked out the park's storm shelter. Thankfully, we didn't need it. By the time the storms arrived late Sunday they were below severe limits. But, the winds kept the moose rocking and rolling! Yesterday the storms had passed to the east, but the gale force winds continued. We spent most of our time inside watching the "waves" on the park's pond in front of our spot. Conveniently located near the intersection of I-57 and I-74, this is a pleasant overnight park. 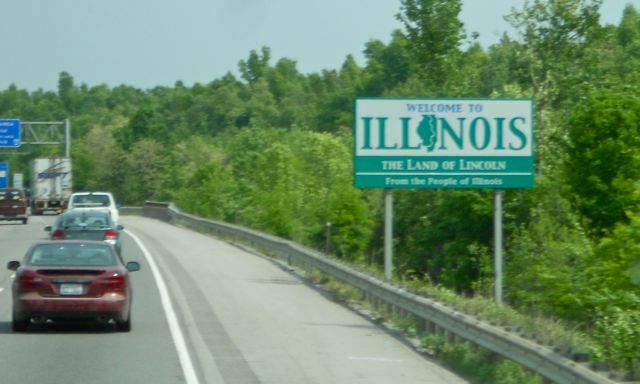 On Illini home game weekends, we understand the place is packed. Today the winds calmed and we went out and about to run a few errands. In the nearby town of Mahomet, we stopped by a cute quilt shop and picked up four more fabrics for our "fulltiming" quilt that will represent The Prairie State. We also logged our first Illinois geocache today. Our hunt took us over the Sangamon River in Mahomet. 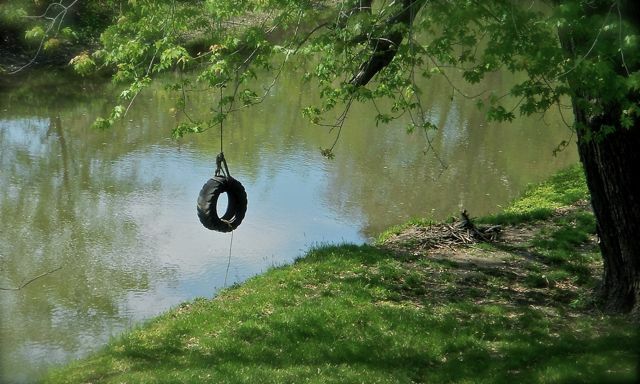 It was too cool to enjoy this tire swing today. But, in a few weeks, this place should be pretty popular! We've enjoyed our three unplanned nights in Champaign. Tomorrow's forecast looks clear of any severe weather as we'll make our way into Iowa. 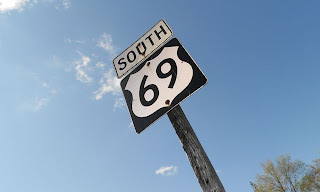 Yesterday's drive from Carthage to Paducah was uneventful. That's just the way we like our travel days. 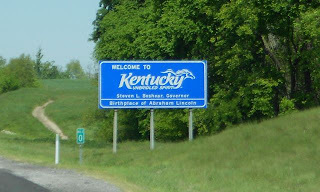 Even though we've passed this way before, it's always fun to cross a state line. 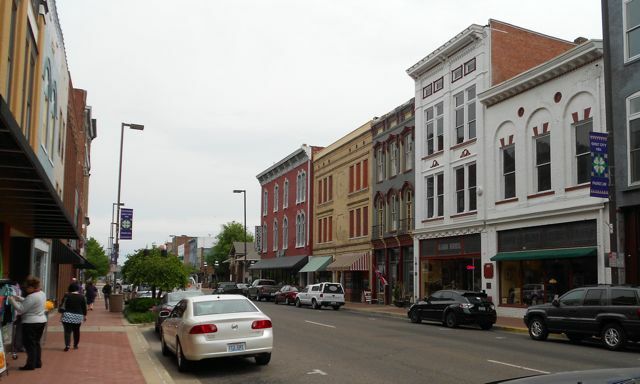 Paducah is an old river town that is working hard to redevelop its historic downtown. While the bulk of the shopping, dining and entertainment options closer to the interstate than than the city center, this area is breathing some signs of new life. It's all quite charming. 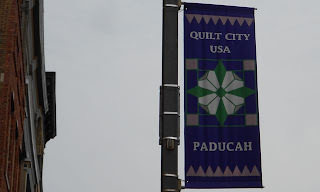 Adding to the city's charm is its proud identity as Quilt City, USA. 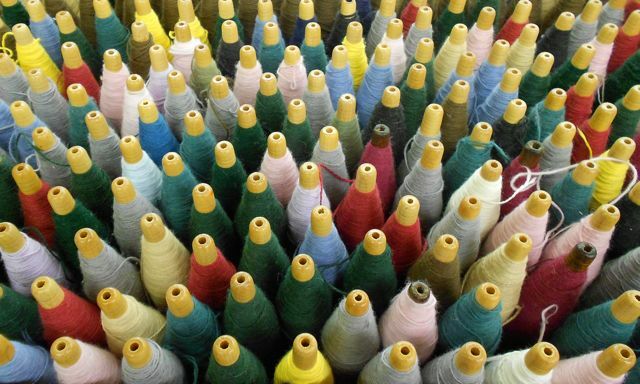 That makes this sleepy little town a sort of "Mecca" for quilters. 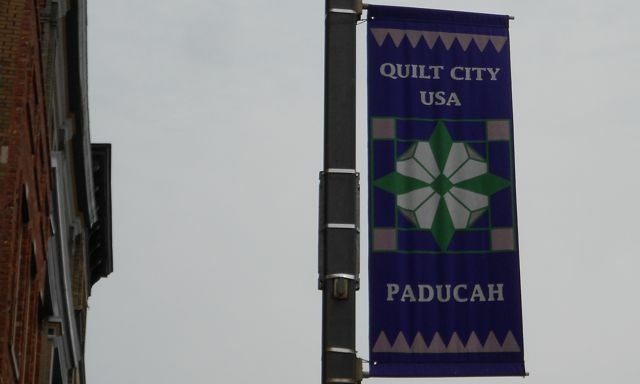 Each Spring, some 35,000 quilters from around the world decend on Paducah to attend the American Quilter's Society Quilt Show. The 27th annual event is in a couple of weeks. Darn! At the center of this Quilting Mecca is the National Quilting Museum. 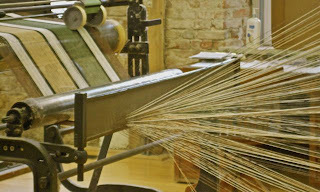 This 27,000 square-foot facility has been committed to the preservation and advancement of quilting since 1991. Paul passed on today's visit. I was happy to explore alone. I've been eager to check this place out since we started our travels. There were no pictures allowed inside, so this outdoor sculpture saluting the history of quilts will have to suffice. Inside I found several captivating exhibits. 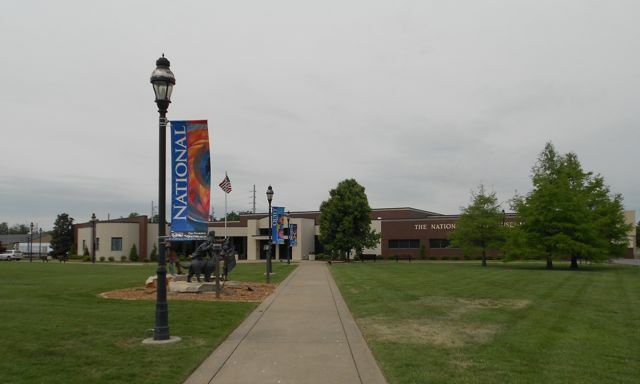 The largest highlighted a permanent collection of 20 years of award-winning quilts, and others donated to or purchased for the museum. 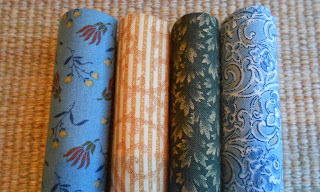 Another permanent collection is a display of miniature quilts. These amazing creations are no more than 24x24 inches, but they are not small quilts. 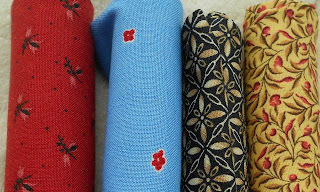 Rather, these tiny wonders are full-size quilts reduced in scale. A temporary exhibit features quilts from the United Kingdom. And, another featured finalists and winners in the annual "old blocks in a new way" competition. This year's competition challenged quilters to design by taking a fresh twist on the old basket block. 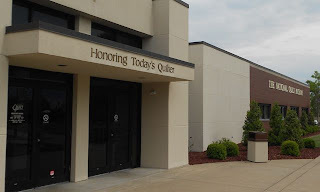 The sign above the entrance declares its purpose to honor today's quilter. Today, I was honored to call myself a quilter. I was also highly intimidated and quite inspired! 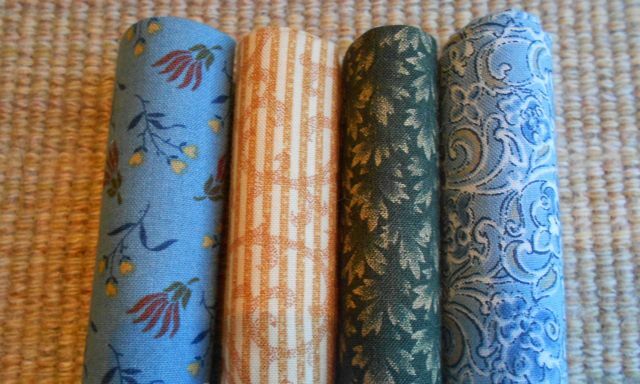 After my tour, this freshly inspired amateur quilter stepped across the street to a cute little shop and found my four fabrics to represent Kentucky in my "traveling" quilt. While I was visiting the museum, Paul was taking care of a few things around our rolling home. We parked at a different place than we did the first time we overnighted here. And, we learned, that was a mistake. The view outside our front window was of the Paducah Auto Auction. And, today was auction day! We've never had so much activity buzzing by our moose. It was loud and dusty. So, we're done here. We'll be back on the road heading north tomorrow. Oh! We just couldn't resist that little play on words. 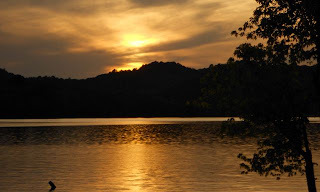 We have so enjoyed our week at Defeated Creek Campground in Carthage. This is one of our favorite campgrounds, and it was a treat to return. 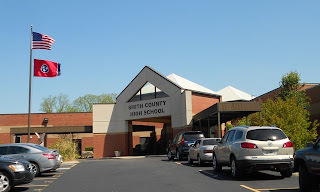 This place is quite popular, and we arrived at the tail end of Spring Break. So, the pickin's were mighty slim when it came to available sites. Site number 5 has to be the most unlevel spot in the place. It has more dips, twists and turns than any slab of concrete should. But, we made it work. Even the sloping sites feature a nice view. The weather has been chilly this week. But, we did make some time to kick back and relax. After the Easter weekend, the park really cleared out. During most of the week these two were our closest neighbors. 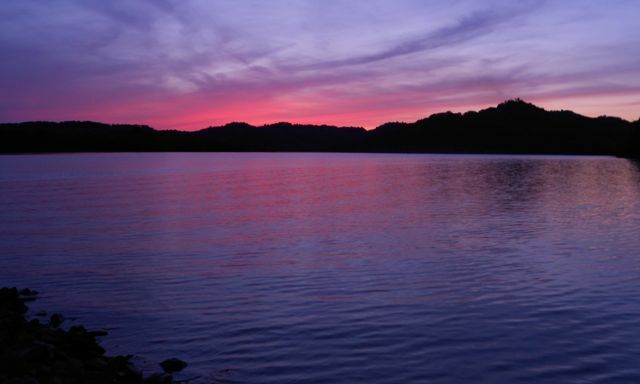 One of the things we love about Defeated Creek are the beautiful sunsets over the lake. We were pleased to see they are just as beautiful in the Spring as they are in the Fall. 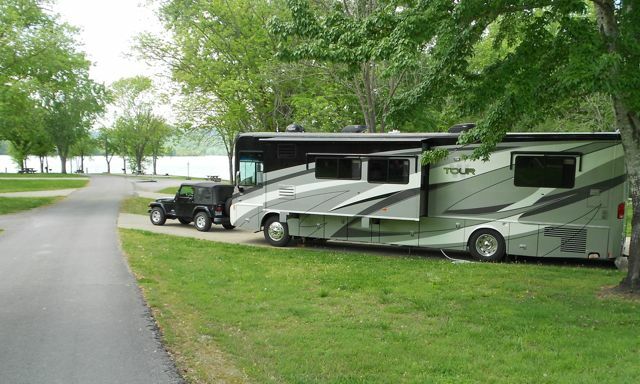 As lovely as our campground is, the real reason we're here is to visit with friends Lisa and Tony and their boys. 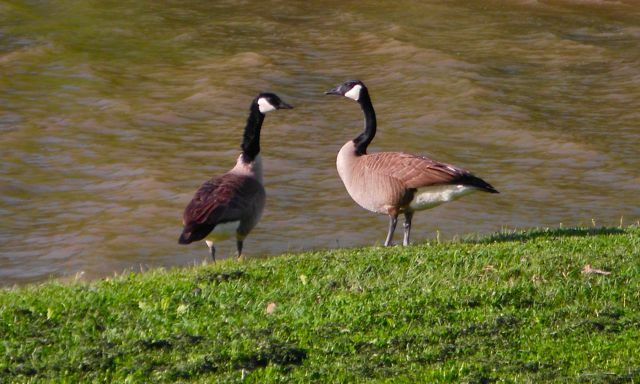 They were camped in the park through the holiday weekend. We all got together for a couple of tasty dinners accompanied by Tony's trademark campfires. It was wonderful to catch up with them. 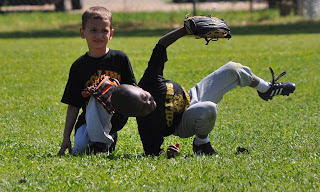 The timing of our visit coincided with the start of son Rick's t-ball season. 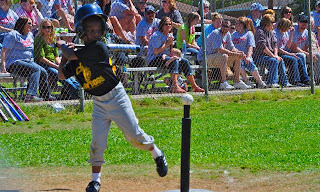 It was so fun to watch him and his teammates. 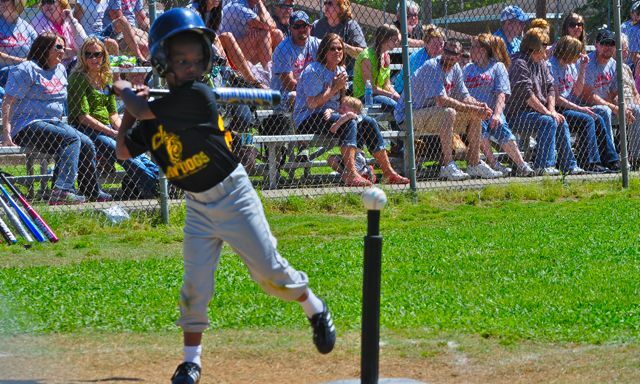 Just look at that swing! And how about that form? Rick was obviously practicing for some dramatic action in the outfield. His teammate? Not so much. 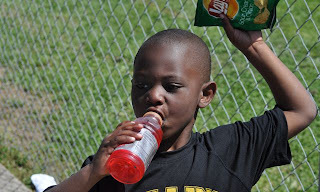 Of course, every ballplayer knows the best part of the game is the drink and snack! 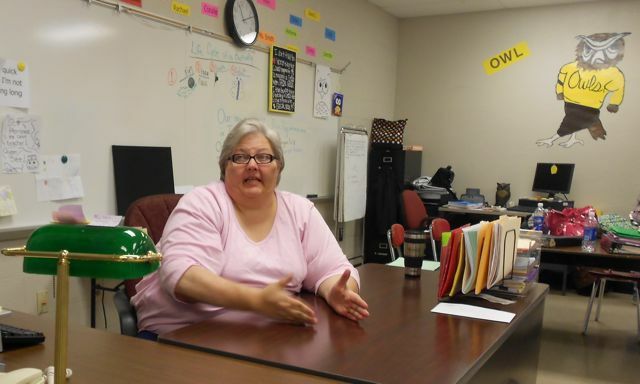 This week, we got to spend time with some of the good folks from the local high school, where Lisa works. Last night, we joined the Smith County High School staff trivia team at a local eatery for their weekly trivia competition. These folks are good! As always, they came away the winners. And, Paul and I were able to help 'em out just a bit. All these miles traveling down the highway while listening to country music paid off when we were quickly able to identify the lyrics to Toby Keith's Red Solo Cup. This afternoon, we stopped by the school for a visit. We stopped in the office and one of the soon-to-be-graduating students gave us an awesome tour of the place. The free tour wrapped up at Lisa's classroom. It was great to meet her students and helpers. Many thanks to Lisa and her family for their warm hospitality. We hope everybody has a wonderful Summer! 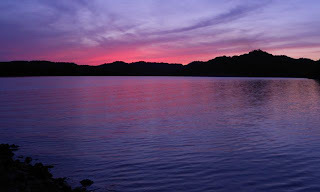 We're enjoying one more sunset at Defeated Creek. As the saying goes, "Red sky at night, sailor's delight." Here's hoping we have smooth sailing into Kentucky tomorrow. After this wonderful week, we're already looking forward to the next time we can return to Defeated again!